If the seasonal fluctuation represents teachers assigning the books during school, then much of the pattern has little to do with kid’s choices, but it does look like the release of the The Hunger Games movie (orange bar) did spark a lot of interest in people reading the books. It turns out that movie releases do in fact spur kids to read the books they’re based on. Just look at The Hunger Games, one of the more obvious example of the movie bump. In February of 2012, the month the movie was released, about 70,000 school kids read the book. In April, the month after the movie’s debut, 180,000 students were turning the pages of The Hunger Games. The same goes for The Lorax, which saw a huge spike in readership the month the movie was released. 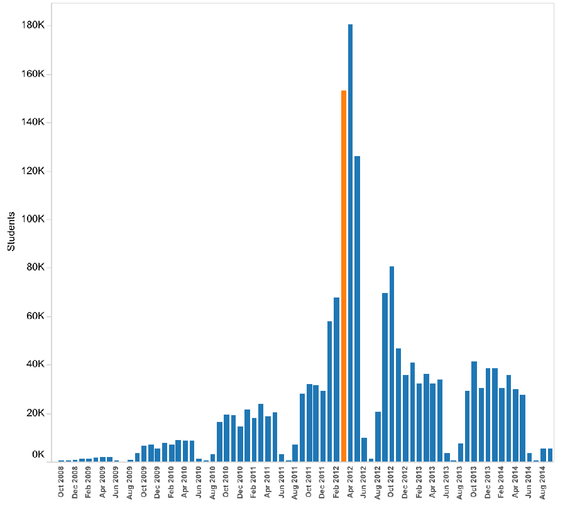 (In these graphs, the orange lines show the month the movie came out.) —The Atlantic. 18 Sep 2014 in Books, Literacy, PopCult. That is definitely the case for Simon. Luc had read them before the movie. Mary Pat Ambrogi Fisk liked this on Facebook.